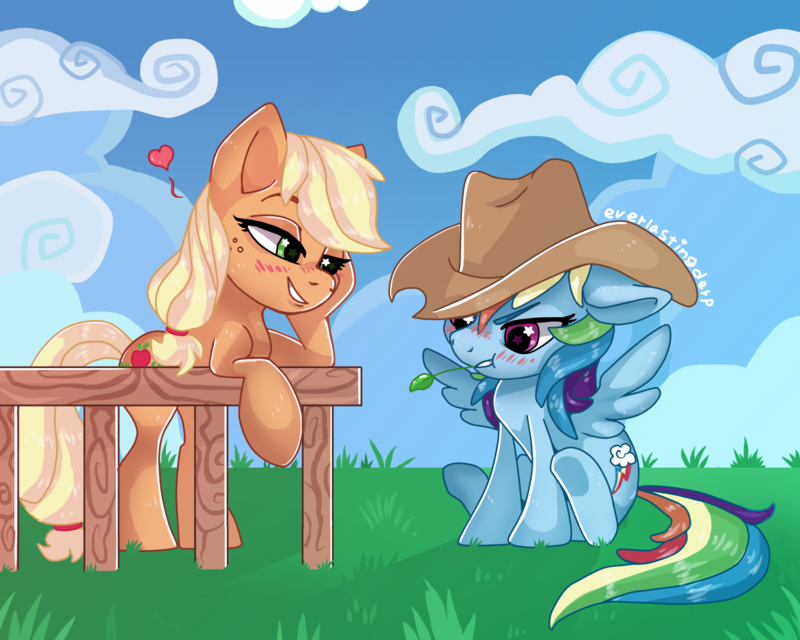 AJ dared Rainbow Dash to try and pull off the cowpony look. Applejack assured her that she definitely won the dare. Dashie tries to maintain composure as she boast about her inevitable victory. I kinda went crazy with this one which is why it took a bit longer. I added a background because I wanted to try my hand at those swirly mlp clouds. Also pretty sure I'm an Appledash fan now. Wow wow wow!!!!!! This is the best! Love the expressions so much You are so talented! Thanks a ton for doing this, it's awesome! PS already blowin’ It up on EQD! Darn it! Someone else recommended it on EQ Daily! And it's also on the front page! Good McJob McDerp! I'm glad you like it. And omg it feels weird being on the front page! My instant reaction is, "wait no, I'm not worthy!" lol but I'm happy about it.